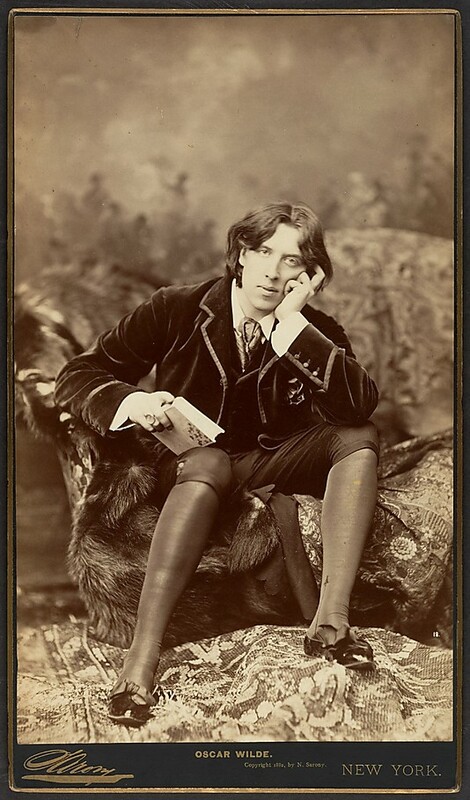 Copyright enthusiasts have added reason to dwell upon Wilde; his image sparked a pivotal discussion on authorship and originality, the effects of which are felt to this day. In 1882, during a lecture tour of the United States, Wilde sat for a series of photographs with celebrity portrait photographer Napoleon Sarony. When one of the photographs was later incorporated, without permission, into a department store advertisement, Sarony claimed infringement. It is not at all surprising that the Supreme Court could appreciate the beauty of the Sarony portrait of Wilde, and with the economic interests at stake at that moment in the history of the photography industry, the result was all but a foregone conclusion. What is, however, remarkable is how the Court could seemingly articulate a standard that could differentiate between high and low art; between art and science (p.389-390). Farley explains that the courts were in an awkward predicament. Photography had been lauded as a mechanical process that captures a scene entirely by technology. An absence of human intervention implied an inviolate image of record. Such accuracy carried great merit, adding value to news reporting, documentary publications and evidentiary processes. To argue that a photograph be regarded as a creative work required another interpretation of photography. The court found such an interpretation by locating creativity in the composition of the scene. According to Sarony’s own brief, he chose the lighting, props, costumes, position, and even the expression of the subject. The Supreme Court uncritically took such a proposition as evidence of authorship, but also took care to limit their decision, “… These findings, we think, show this photograph to be an original work of art (emphasis in original).” The specificity allowed other photography to remain as purely mechanical. The person operating the camera always exercises choice in producing a photograph. There are creative choices in the precise timing to click the shutter, the angle of the shot, the frame, the focus, the distance from the subject, the centering of the subject, etc. (p.434). [The] Court would have some difficulty relying on this possible act of authorship because Sarony did not actually operate the camera. Sarony was not a photographer in the modern or technical sense. He was not interested in the camera work. Instead, he regularly employed a cameraman, Benjamin Richardson, to work the camera. There is no evidence that Sarony, as directorial as he was, had given any direction to Richardson about these technical choices. There is no indication that Sarony cared about that dimension of choice (p.434-435). In action, Sarony was a very hands-off photographer. He took no photos himself, delegating the task to his assistants while he gazed distractedly out the window. Nor did he develop the finished products, bragging that he did not know anything about the developing process (p.35-36). Indeed, the developing process could also have been a place to locate creativity. As was also the selection of which photographs to register and publish. Farley explores all these avenues in detail and returns to the challenge the Court faced in ensuring photography’s standing as an untampered record of truth. Over the next century, courts would slowly recognize that the activity at the camera and laboratory had a place in the examination of authorship, but Farley’s work illustrates that the rationale employed in Burrow-Giles has surprising staying power. My tragedy has lasted far too long : its climax is over; its end is mean; and I am quite conscious of the fact that when the end does come I shall return an unwelcome visitant to a world that does not want me (p.22). Sadly, Wilde’s pronouncement of the world of his lifetime proved to be accurate. Shunned and impoverished, he died with little fanfare in 1900. That his work would be held in such esteem in the century that followed, likely never crossed his mind. It is nearly a week since Steve Jobs passed away. The outpouring of emotion and the artistic manner it often appeared in, seemed both startling and natural. It was a testimonial to Jobs’ conviction that art and utility worked together. Of all the tributes, nothing captured more attention than Jonathan Mak Long’s creation, where a silhouetted profile of Jobs served as the bite from the famous apple. The word ‘original’ does not in this connection mean that the work must be the expression of original or inventive thought. Copyright Acts are not concerned with the originality of ideas, but with the expression of thought… The originality which is required relates to the expression of the thought. But the Act does not require that the expression must be in an original or novel form, but that the work must not be copied from another work — that it should originate from the author (p.608-609). The circularity of definition notwithstanding, the last phrase set the bar of originality as separate from the question of uniqueness. Originality is a question of origin. The expression of thought must be new to the author. But while law awards the label of originality on the basis of individual thought and expression, society is less fair-minded. Whoever speaks, illustrates, composes and then publishes first, gains a prestige at the expense of fellow creators. [It took the world over a century to allow both Newton and Leibnitz equal claims to Calculus]. The assumption is that any similar, or near-identical work, must have been copied. It is a sobering thought – that all work must either be seen as unique or condemned to the stamp of plagiarism. Abraham Drassinower, “Taking User Rights Seriously,” in In The Public Interest: The Future of Canadian Copyright Law, ed. Michael Geist (Toronto: Irwin Law, 2005). Tomorrow we shall see what form of copyright amendment is coming back to Parliament for debate and realization into law. If the inclusion of “education” to fair dealing has survived the campaign to discredit it (see here and here) and becomes a legitimate category in fair dealing, this will help to protect teaching practices. But, if education should not survive, we can still do quite a bit with fair dealing as it exists. As has been written many times on this blog, fair dealing is not license to copy and distribute at will. It is a nuanced exception within the system of copyright. But the atmosphere of copyright, at this time, is one of confusion. The resulting wariness means students aren’t getting the same course material they received in the past as guarded professors choose to simply eliminate material from classes they teach rather than risk a lawsuit. … Libraries and copyright officers have been swamped with work this fall, trying to clear the course materials assigned for classrooms. Sorry as I am to hear that, the larger problem is the degree to which existing teaching practices are scrutinized for copyright infringement. Individual teachers have been implicitly, or explicitly, instructed to remove any copyrighted material from display during lectures. Such a directive has no basis in law. It ignores fair dealing entirely. The purposes of criticism and review (found within existing fair dealing) favour the use of quotations, illustrations, diagrams, flow charts, film clips and software snippets – in short, any copyrighted material – when such inclusion serves the purpose of conveying concepts to students. To fortify this behaviour under fair dealing, attribution is important. But with citation being the backbone of academic practice, it is likely that teachers already take care to identify their source materials to students. A lecture is an original expression of an idea. Said another way, a lecture is a copyrightable work on its own merits. The fact that this work contains copyrighted elements is not a negation of the copyright status of those elements but neither does it require permission or payment for those elements. This is precisely the behaviour that fair dealing protects; provided one can fall within the existing categories of private study, research, criticism, review and news reporting. Of course the question will arise, can this work – known as the lecture – be distributed to students? That is a decision for the copyright holder of the work, namely the author-teacher. I read of Professor Jeremy Richards’ decision to remove some elements before distributing his slides to students – that is his prerogative. I do not have much sympathy for students who require a lecture-to-go. Professor Richards makes a cogent point that students could gain more by taking notes by hand instead of “letting it all wash over [them].” But in any case, the decision to distribute remains at the discretion of the individual who created the whole work, not the copyright holders of the constituent parts. For a work to be “original” within the meaning of the Copyright Act, it must be more than a mere copy of another work. At the same time, it need not be creative, in the sense of being novel or unique. What is required to attract copyright protection in the expression of an idea is an exercise of skill and judgment. By skill, I mean the use of one’s knowledge, developed aptitude or practised ability in producing the work. By judgment, I mean the use of one’s capacity for discernment or ability to form an opinion or evaluation by comparing different possible options in producing the work. This exercise of skill and judgment will necessarily involve intellectual effort. The exercise of skill and judgment required to produce the work must not be so trivial that it could be characterized as a purely mechanical exercise (para.16). Today was an eventful day. Ministers Clement and Moore set the stage for amendment to the Copyright Act with their op/ed in the National Post. The Ministers emphasized the importance of facilitating creative effort in Canada. To that end, the Parliamentary process for amending the Act has begun with the Notice Paper. But something more significant was happening elsewhere. The Canadian Club of Toronto honoured Chief Justice Beverley McLachlin as the 2010 Canadian of the Year. The award is presented to individuals who have, “improved the lives of others and benefited us as a nation.” The Chief Justice oversaw some landmark moments in Canadian copyright history, the most critical being the CCH Canadian case of 2004. CCH Canadian confirmed the individuality of every instance of fair dealing, provided a framework of exploration for each dealing, and emphasized that fair dealing was an integral part of copyright law. However, the case also addressed originality. At issue was whether the headnotes summarizing court cases were sufficiently original to quality for copyright. When courts adopt a standard of originality requiring only that something be more than a mere copy or that someone simply show industriousness to ground copyright in a work, they tip the scale in favour of the author’s or creator’s rights, at the loss of society’s interest in maintaining a robust public domain that could help foster future creative innovation. … By way of contrast, when an author must exercise skill and judgment to ground originality in a work, there is a safeguard against the author being overcompensated for his or her work. This helps ensure that there is room for the public domain to flourish as others are able to produce new works by building on the ideas and information contained in the works of others [Para. 23]. The term public domain is also not defined in our Act. Connotation of the phrase ranges from the benign (that which is freely available to the public) to an aura of degradation (to fall into the public domain implies a loss of stature). Common to both interpretations is the belief that material in the public domain is absent copyright, either through expiry or ineligibility. As I have noted the World Intellectual Property Organization defines the public domain as, “… the realm of works which can be exploited by everybody without any authorization.” This includes work lacking copyright protection, however, it also includes currently copyrighted material accessed in accordance with exceptions detailed in our Act. Including fair dealing.